Vacation is exhausting, but I had a free moment to check my favorite blogs. Thanks Erika for sharing this article. I LOVED it! After two painless flights to Portland (both airports had playgrounds!) we arrived to rainy Pacific Northwest weather. No bother, Mike and I both love the beauty that the rain produces. Wednesday morning we hurried over to my Grandma's new place and surprised her. 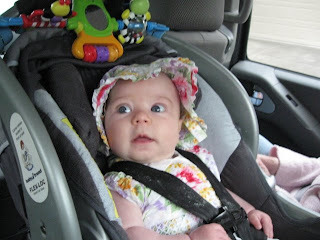 Above, Margaret is excited to meet her Great grandmother! This picture is truly special because this is not like Margaret at all. She would rather fall asleep in her car seat or alone on a floor than fall asleep with someone holding her (which did make the flight here a bit more difficult because she was a "lap child." That was not the case with Great Grandma Phyllis. She snuggled right up. 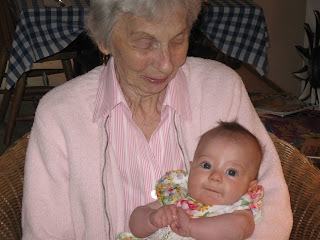 Margaret knows that she is Great Grandma's namesake. There are many other people that Margaret is meeting for the first time and I will try to post some of those photos as well. To the Great Pacific Northwest!!! Modest Mama and her crew have decided to head out and see what kind of trouble we can find in the Great Pacific Northwest. 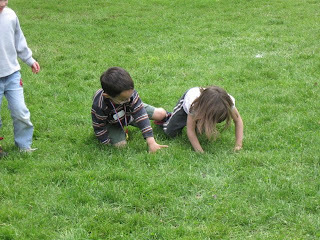 Here we are at Mount Hood in June 2004. It is hard to find places as beautiful as Mount Hood on a summer day. I am not sure what our schedule is while we are out there this time. Since our entire family(on both sides) is in Oregon right now and no one in my family has met Margaret yet, I am guessing that we are going to be pretty busy. The exciting part is that my Grandma doesn't know that we are coming. I told her money is pretty tight and we wouldn't be able to visit this summer. This was especially hard for her since Margaret is her first great-granddaughter in 17 years and also since I named Margaret after her and also after her mother. Well, our Japan trip got put on hold for a bit and so we were able to come up with the airfare for Portland. Other members of the family agreed to keep our visit a secret so that Grandma would be surprised. Everyone helped out to provide us a couple cars to use and a place to stay. Since this is a scheduled post, we have survived the two flights to Portland (arriving at 3am Eastern time) and Grandma has already been surprised. 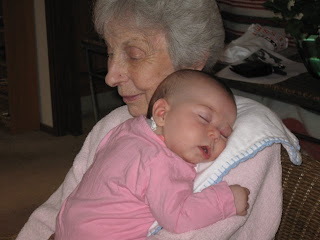 I will try to post some photos of my beautiful Grandma holding her precious great-grandchildren as soon as I can. "My, you have your hands full!" 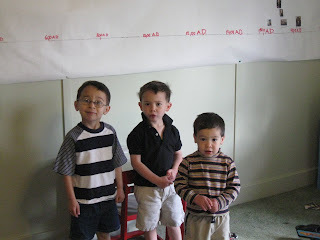 I first got this comment when Isaac was an infant and James was a toddler. I had them both in a double stroller and I was pushing them through Downtown Decatur, GA. At the time I was so pleased to get this comment. I felt like I had achieved some unspoken status symbol. I now had enough children to have my hands full. Lately, I have been getting this comment everytime we leave the seclusion of the house. I now have four children six and under. To some, this seems like a lot. To others, I am just getting started. I have what some women desire more than anything else. I have my hands full. Full of children. I wouldn't be so annoyed about receiving this comment so often except that the person to say this comment almost always states it in a way to suggest that this is a bad thing. I say "person" but I have never once received this comment from a man. 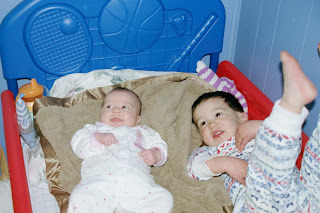 The comment usually comes from a middle-aged or older woman who takes one look at my crew, catches my eye and says, "My, you have your hands full!" Borderline rudeness hints in the undertone. A smug look sometimes follows as if she has said the most insightful thing I have heard all day. When in reality, I have probably already heard this comment at least twice that very day. If I happen to be at Walmart or the library, then most likely I have heard it in the last five minutes. How to respond, oh, how to respond? The rudeness, if present, is so subtle that I would never want to respond in a way that might seem rude. I wouldn't fight fire with fire. Not in this case at least. 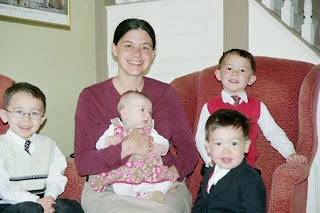 My friend Alexandra once taught her girls to reply, "Full of love!" whenever she got the comment. Clever, but also not my style. Truthfully, I don't know how to respond in my own unique and clever way. I mostly just say, "Yeah, I do." or "Yup." and continue to get my groceries before the ticking time bomb (I mean Margaret) explodes and we have to run for the car. What I am trying to relate here is this: It doesn't really matter how many children a woman has, every mother has her hands full. Heidi has one, Annie has two, Eugenie has five, Jo has twelve. Every woman who is a mother has her hands full. 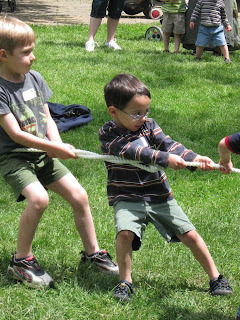 I dare someone to approach my friend Erika and claim that she is not as busy as myself because she only has two children opposed to my four. Mothers with less children still only have 24 hours in the day. Once in a while I am not completely distracted and can retort in a timely manner (you know, like when the person who made the comment is still standing there as opposed to that night after dinner when I am blogging about the comment). My reply is: "Oh yes, I am truly blessed/lucky/fortunate, etc." I do not deserve these children. God has allowed me to experience a little bit of heavenly happiness here on Earth. Society teaches that I am not suppossed to like being a mother this much. I have been oppressed and mislead. But there is something sacred about motherhood. Something that my BA in Women Studies forgot to mention. Yes, I am sometimes so busy that my head spins. My arms ache from the weight of carrying multiple children. But when I am out alone, I often feel that something is missing. My children have become a part of me. My hands truly are full of love. We bought our house in Western Pennsylvania exactly one year ago today! 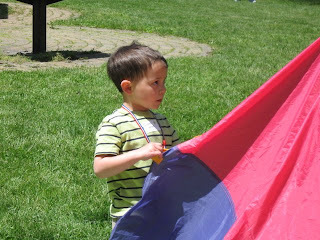 I thought I would show some pictures of our homeschool field day. 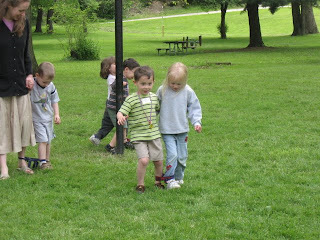 It was the perfect weather to spend the day at the park with friends. 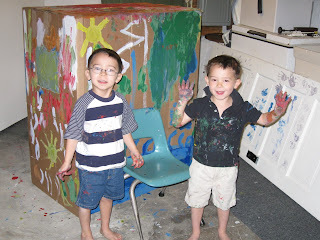 There were at least 50 children who participated! 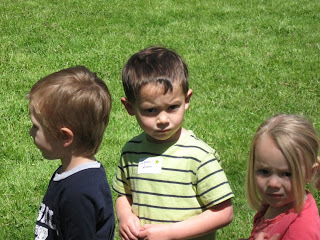 Above, Isaac is still unsure of the whole event as he waits to play the first game. 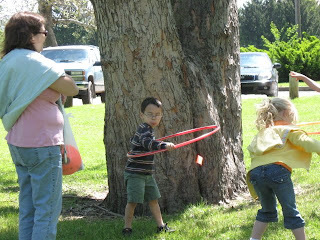 James wastes no time getting started in the hoola-hoop game! 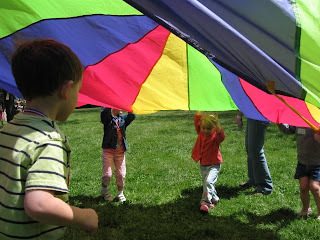 Time for the parachute! Still a little unsure. 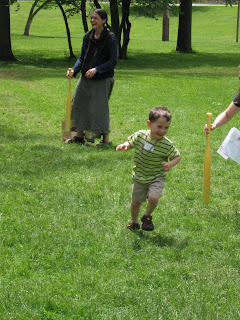 Isaac at the "Dizzy Bat" game. Finally a smile! Go Isaac!!! Henry looks nice here, but he was basically a nightmare for the entire time. 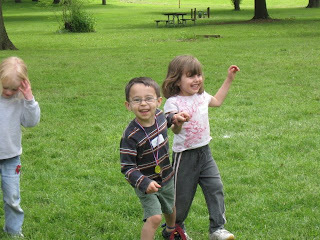 The three-legged race was a big hit! 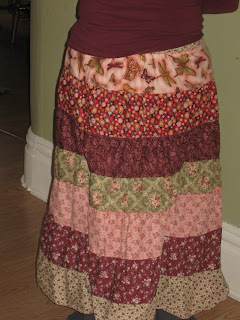 In anticipation that summer will eventually come to Western Pennnsylvania (and also since I am bringing my machine in to be serviced and won't have it for two weeks), I decided to make some skirts. They are all very different and were fun to make, but the photos perhaps make them look nicer than they are. The flowered one with the brown side panels turned out the nicest. Michael doesn't like that one, he says that it is too loud. 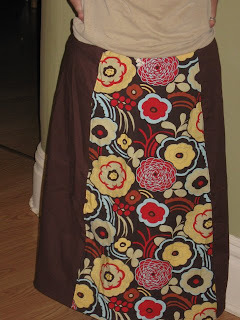 The other brown skirt with the orange flowers is almost beyond repair, but it looks fine in the photo. I don't think that I can wear it without fixing the waist- maybe I can do that later this summer. 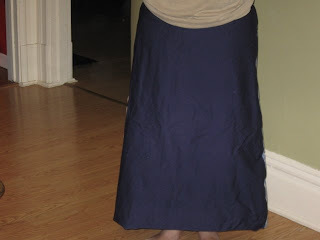 The dark blue one has a light blue tiered back, but I didn't pull the elastic tight enough and so it is a little loose. Hopefully the boys won't pull it off me as we are crossing the street or something. The light blue with flowers and the band across the bottom has very crooked seam lines, which aren't visable in the photo but very visable in person. 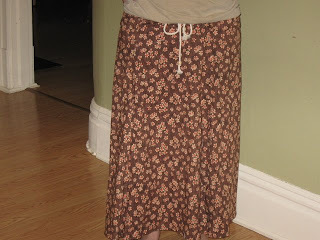 I need to work on straight seams and waistbands. Last night Mike and I watched the movie: "The Namesake." It is based on a novel by Jhumpa Lahiri (seen above). The movie is about an Indian family that moves to the USA and raises their two children. The story focuses particularly on the oldest son Gogol. Mike and I both thought this was a pretty good movie. It does have some racy bed scenes (what new movie doesn't?!?! ), but the overall message and movie is good. I had seen a preview for this movie and the movie itself was a lot different than I thought it was going to be from the preview. A lot more background context was established and it focused more on the meaning of "family." Michael and I both have interest in India. Michael spent time there after college, and I have always been facinated with the culture and religion- especially in the context of the roll of women. I think this movie exceeded our expectations. Due to the racy scenes and many adult themes, it is definitely not a "family movie night" movie. But if you see it at your local library or get it through NetFlix, it is definitely worth watching. Michael in particular says that he highly recommends the movie. 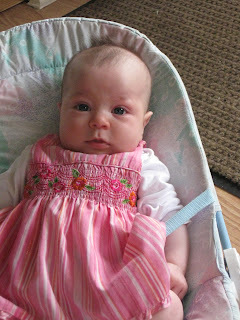 There isn't much to say about a three month old baby that hasn't been said before. Margaret spits up a lot. She smiles and coos. 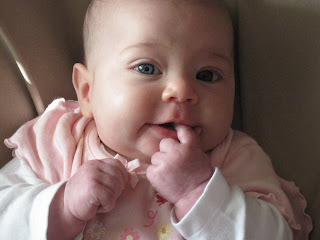 She has just found her hands and studies them intently. I know my folks and my grandma appreciate lots of pictures of her and so I try to post a couple a week. She doesn't really do much yet, she just likes to hang out with her mama and watch her noisy brothers (who are currently flooding the bathroom despite many threats aganist their personal well-being!). 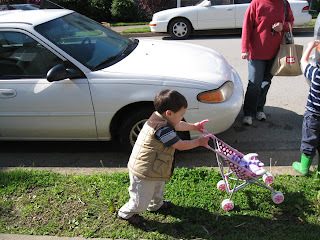 A nice thrift store find for Henry: a baby doll stroller. He used it to push his stuffed rabbit around in. 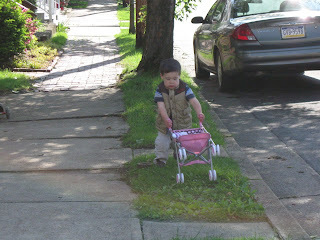 At one point he was attempting to carry the stroller up the stairs and the rabbit tumbled out. 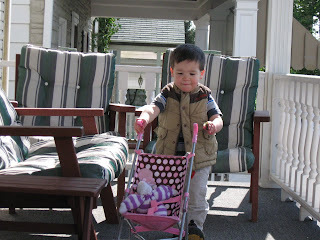 He set the stroller safely on the porch and said, "Good thing my stroller didn't fall down the stairs. 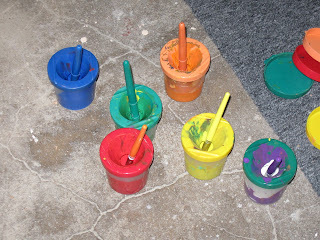 It would have gotten all dirty!" So much for the safety of the bunny. Another rainy day here. James is now requesting that we call him Beethoven. This is probably due to his current obsession with playing rondos on the piano. 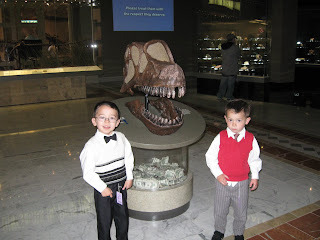 Isaac has announced that he wants to be a Tyrannosaurous Rex when he grows up. Me: "Even when she starts solid food she won't be able to have any milk that is not from me. So that means no cheese or milk from cows." Me: "Uh, yeah. No milk from rabbits." In other news James (Beethoven) asked me if I knew why he liked Augustus Caesar more than Julius Caesar. It is because Augustus didn't tell the Senate (who is in charge of the councils) to call him King in the way that Julius Caesar did. And I'm the one with a Master's of Science Degree! 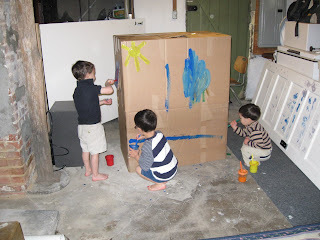 In order to properly construct a clubhouse, you must first gather your materials. 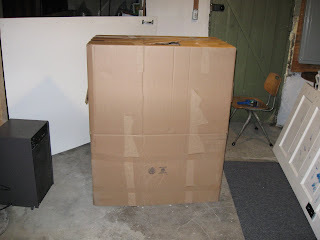 Number one: a large cardboard box. No other instruction is neccessary. 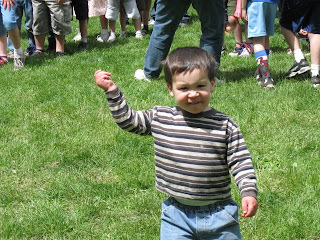 Today is Isaac's Feast day- the Feast of Saint Yves. 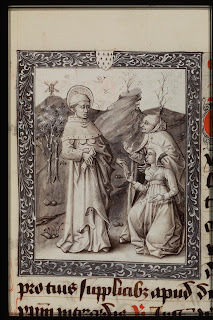 Saint Yves (pronounced "Eve") was a French Lawyer from Brittany who died in the early 1300s. Feast Days are very important days in our family. Today Isaac got to go to Mass with just Michael and then to Dairy Queen for a special icecream treat. 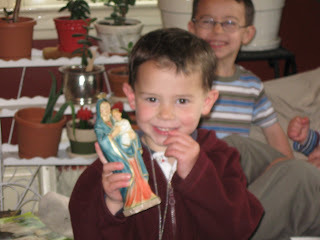 After a treasure hunt with picture clues he opened up presents including a Saint Benedict metal and a statue of the Blessed Mother holding our Lord. Grammy sent a Grader Tonka truck which was a big hit with the brothers! Tonight Isaac will enjoy his favorite dinner of homemade Mac n' Cheese with sausage. 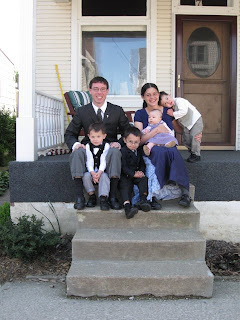 Today is also a special day for Michael and I as we celebrate seven years of marriage. 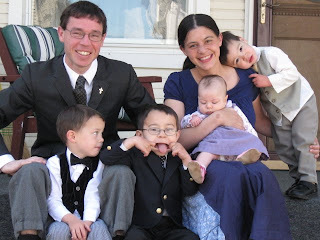 When we got married we were both graduate students living in a one-bedroom apartment in Boston. Since then we have moved four times and been blessed with four beautiful children. We are so thankful with all the blessings Our Lord has bestowed on our family! 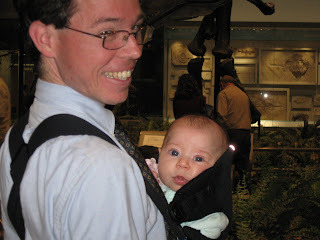 A few weeks ago we splurged on a preminum level membership to the Carnegie Museums in Pittsburgh. 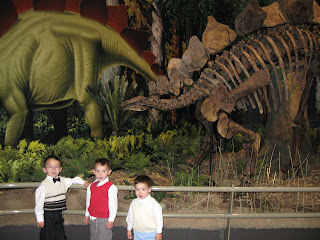 It allows us unlimited access to four Pittsburgh area museums for one year. Because of the level of our membership, we can bring eight additional people with us and we can visit museums in many other cities for free. 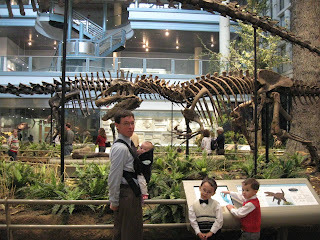 Today we visited the Natural History museum (which would have cost us $52 without the membership). Yes James is wearing a bowtie. We are those kind of parents. 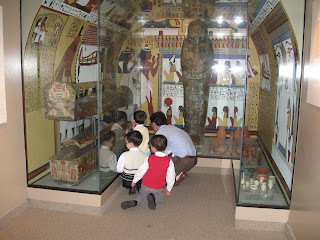 The ancient Egypt exhibit was also a hit. 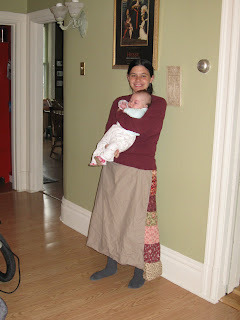 Many thanks to Eugenie who walked me through sewing the elastic piece onto this skirt. 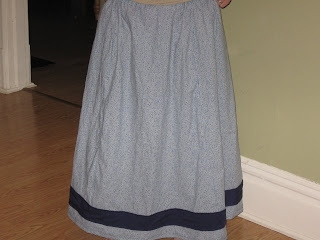 Two phone calls and many frustrating hours later, the skirt was finished. 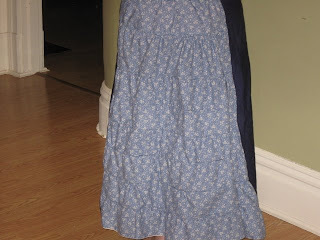 It is definitely decent enough to wear, especially since I am the only one who can see the seams. 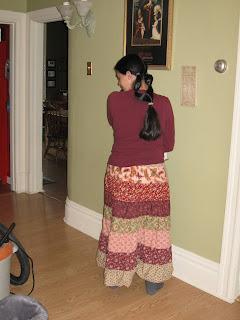 I never figured out the art of shirring, and I am wondering if my machine can even do it. I am taking my machine to be serviced later this month and will have to ask. In the meantime, I think I will stick to drawstring waists. Here's a lovely photo taken in the entry room. Michael is in the process of stripping the paint off the banister, railings, and staircase walls and so it looks different every day. There is even a noticeable difference from the time this photo was taken a few days ago. The places in the background that are white and brown are now restored to the original oak and pine wood. Margaret LOVES to be near Henry. The feeling is definitely mutual as Henry is always willing to share his night-night with Margaret (see above photo). For those of you unfamiliar with Henry's night-night, it is a very sacred object and life can not continue in any fashion unless we know the exact location of the night-night at all times. To even touch the night-night without invitation is strickly forbidden. Henry doesn't even let his Mama share the night-night when we are snuggling on the bed. But he is always willing to allow Margaret full possession of the night-night. He sums up his reasoning with the following remark: "She is just ah whittle bay-bee!" We finally had a break in all the spring rain to enjoy some time outside. 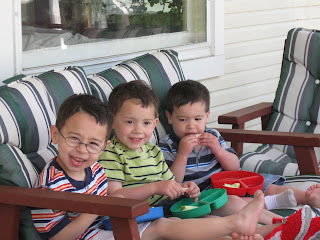 It was warm and sunny and the boys enjoyed eating lunch on the front porch and riding bikes up and down the sidewalk. Since rain is in the forecast for most of the rest of the week, Michael decided to take advantage of the sun and took James backpacking for the night. They hike into these shelters run by the forest service. From the trailhead to the first set of shelters it is only about a mile. James is excited because he gets to use his pocket knife whenever they go backpacking. We had some nasty wind on Mother's Day- nothing like the Southern states (Thank Goodness!!! 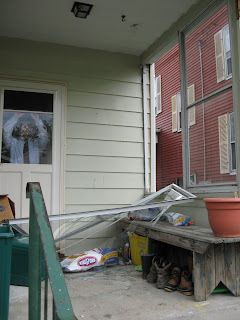 ), but enough wind to blow out the windows on our back porch. It wasn't just the glass that blew out, but the frame and all. The funny thing is that Michael and I were just talking about how nice it would be to enclose the back porch so tht we could use it more of the year. 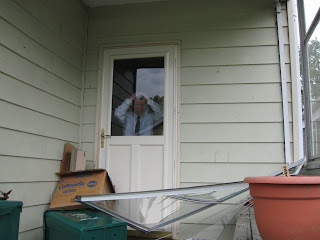 This may just be our opportunity to replace these cheap quality windows with something more decent and durable. 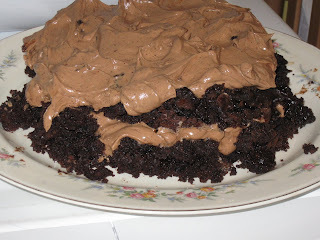 Have you ever wondered how a cake would look if you followed the recipe, baked it for seven minutes, realized you forgot to add the sugar, took the pans out, mixed in the sugar, and finished baking the cake? I don't have to wonder any longer! Despite how it looks, this is possibly one of the greatest cakes I have ever had. The original recipe (when followed correctly) is from the Monks at St Vincent. The frosting is mocha chocolate buttercream from the Joy of Cooking. Yummy! My friend Annie said that Margaret looks exactly like a Krom girl should look. $10,000 for a Birthday Party?? ?